BAIDOA, SOMALIA - JUNE 11, 2014: A severely malnourished Abdirahman, 9 months, is held be his mother, as he waits to be weighed and have a nutritional assessment at the Baidoa regional hospital on June 11, 2014 in Baidoa, Somalia. Baidoa, the centre of the 2011 famine that killed over 260,000 people is under new threat of famine, due to poor yields and the Al-Shababs continuing to block aid travelling by road to the Western City of Somalia. Mother, Hawa Ali, 24, traveled to the hospital in Baidao from Deynun, a town 180 KM away. 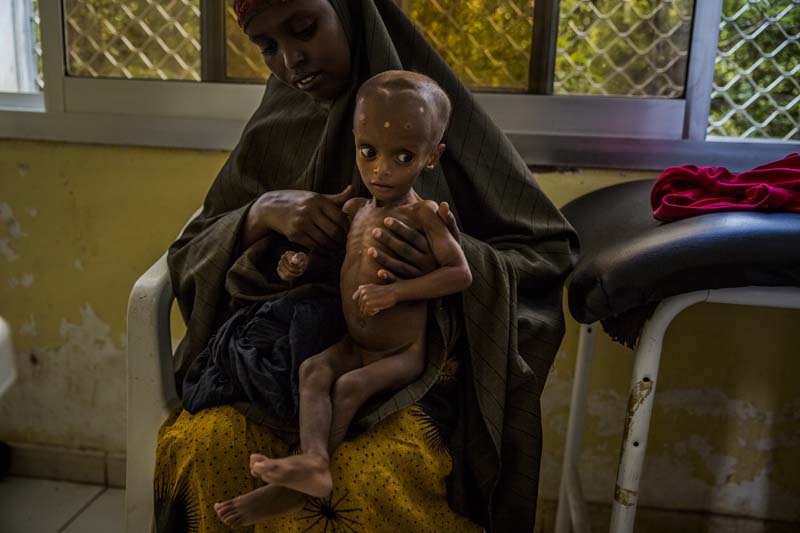 Abdirahman weighed 3.2 Kilograms, and should be 7 Kilograms at his age), the child was vomiting severely.